It's well noted that London contains a 'hidden city' of tunnels, sewers, bunkers and other subterranean spaces. Many are semi-secret and never visible to the public. Yet any underground chamber (tombs excepted) must be ventilated. Keep a careful eye open while walking the streets of London and you'll find these clandestine shafts everywhere. They are often the only visible clue to the hidden world beneath our feet. Many ventilation shafts hide in plain sight, obfuscated as buildings, columns or other forms of architecture. And no small number were designed by famous names — Heatherwick, Paolozzi and Foster included. The gallery below shows a few of the more novel examples that we know about, but you can find further instances on just about any central London street. Ever noticed this New Classical structure in Gibson Square, Islington? It's no thing of beauty, but it could have been a lot worse, for this is a ventilation shaft for the Victoria Line. 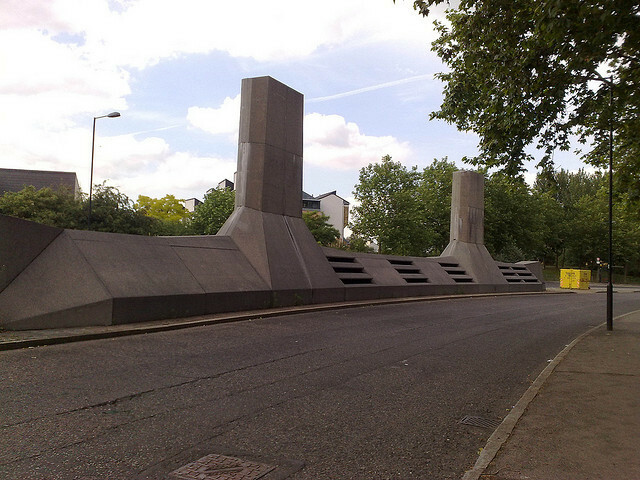 The structure was designed in the 1970s by Quinlan Terry, perhaps most famous for his work on Richmond riverside. The lack of windows and meshed metal roof give the game away. Image by M@. 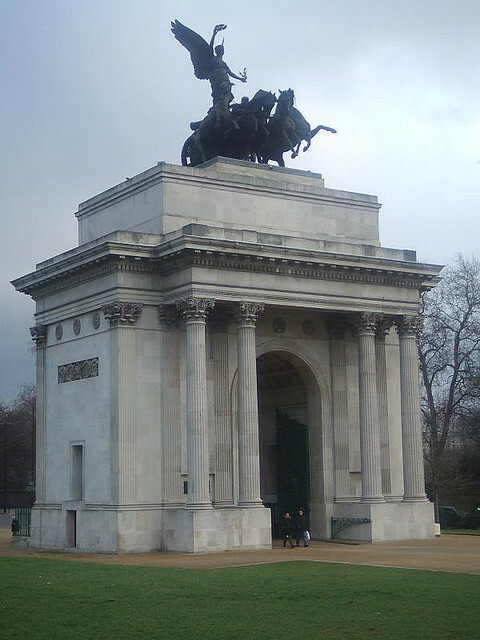 Wellington Arch, or Constitution Arch as it is sometimes known, is a prominent landmark on Hyde Park Corner. It contains a small museum and viewing platform under the control of English Heritage. Less well known is that one whole side of the structure served as a (now disused) ventilation shaft for the Piccadilly road tunnel underneath (you can see the grille below the left shoulder of the arch). Ian Visits has more. Image by M@. 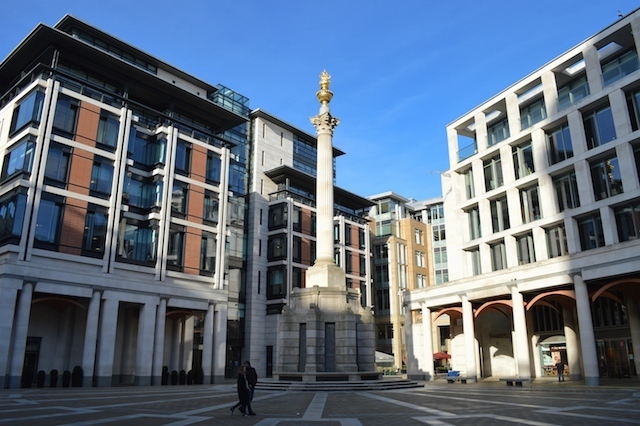 A classical column forms the centrepiece of the polite if standoffish Paternoster Square development. But look more closely, and you'll see that the copper-topped column is functional as well as decorative. A number of grilles around the base let out hot air from an underground service road. The cunning column was designed by the practice of Sir William Whitfield, who also gave us Richmond House in Whitehall. Image by M@. 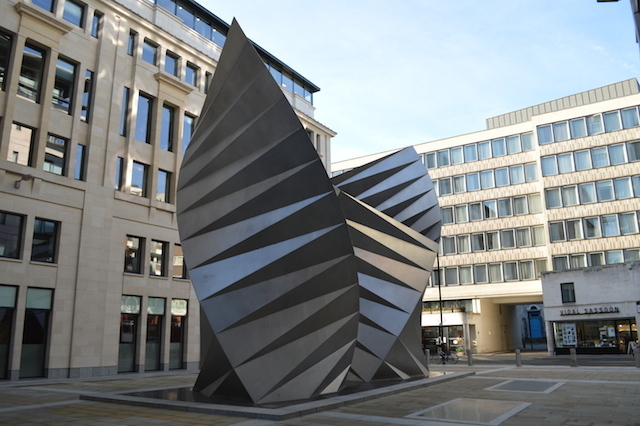 Also in Paternoster Square, these metallic wing structures were designed by the all-conquering Thomas Heatherwick (Garden Bridge, New Routemaster, Olympic cauldron, etc. etc.). They serve as cooling vents and radiators for a subterranean electricity substation. Image by M@. Those lucky enough to live or work in Park Crescent, at the north end of Portland Place, can gain access to these pleasant gardens. 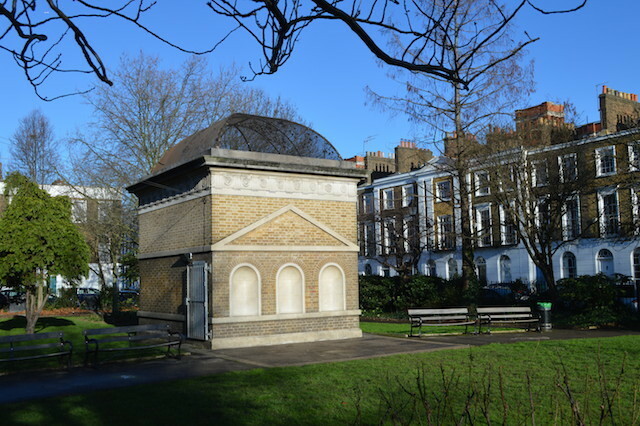 They hold several subterranean surprises, including a little-known tunnel under Marylebone Road, and these two octagonal structures, which mask ventilation shafts for Regent's Park station, directly beneath Park Crescent. Image and further info by Caroline's Miscellany. 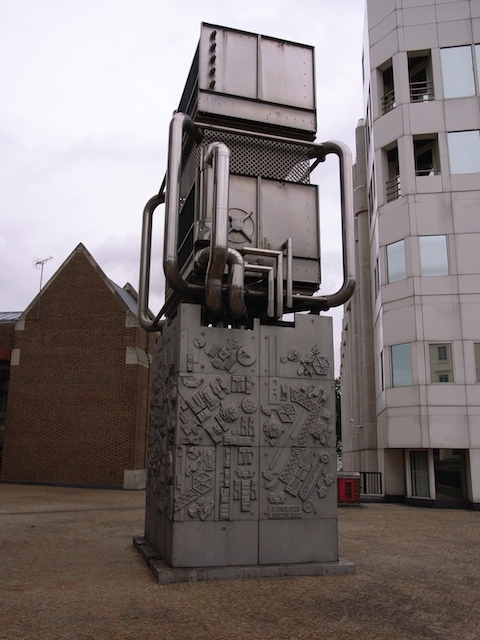 Sir Eduardo Paolozzi made many contributions to London, including the currently topical Tottenham Court Road mosaics, and the statue of Newton outside the British Library. One of his more understated works, from 1982, can be found outside Pimlico station -- a grey ventilation pipe decorated with his usual melange of mechanical motifs. Image by Steve Cadman under Creative Commons copyright. 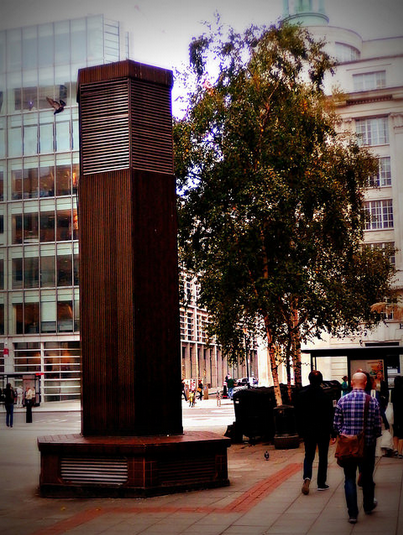 This shaft can be found where Leather Lane meets High Holborn. Of all the structures in this gallery, it is most obviously a ventilation shaft, but for what? It is now the only visible surface sign of the Kingsway Telephone Exchange, a vast complex of telecommunications tunnels dating from the 1940s. Image by HoosierSands in the Londonist Flickr pool. The so-called Camberwell Submarine lurks menacingly on Akerman Road SW9. Far from servicing a not-so-secret nuclear bunker, the concrete structure instead ventilates a local heating system. Urban75 took a look inside a few years ago. Image by secretlondon123 in the Londonist Flickr pool. Stink pipes! These tall metal shafts can be found all over London, both centrally and suburban. They were first installed in Victorian times to let dangerous gasses out of the sewers. 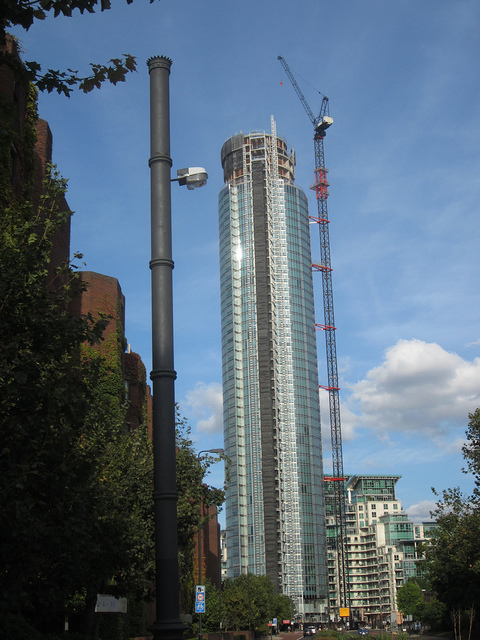 This example was photographed a couple of years ago near Vauxhall (it's the tall, thin one on the left, although we've deliberately framed it next to the St George Tower for those who enjoy making sardonic comparisons). Image by M@. Ignore the camp king in the foreground. 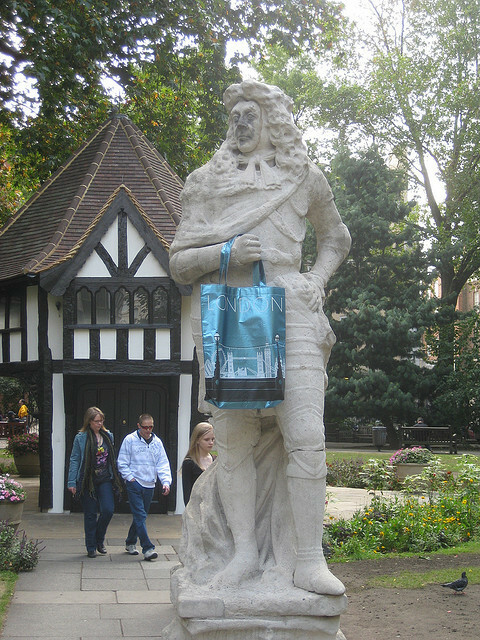 We're looking at the famous mock-Tudor hut in the middle of Soho Square. 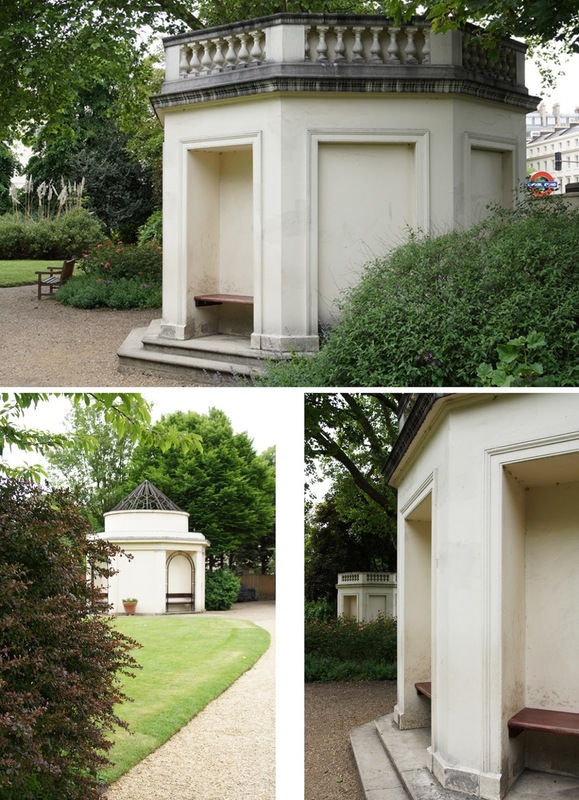 Various online accounts claim that the hut contains ventilation for the WWII shelter that sits beneath the square. We're not entirely sure if this is true, but the shelter definitely exists, and is currently up for sale. Image by M@.